You may not like it, but, nowadays, even your teeth are jumping on the “eat healthy” bandwagon. There are two schools of thought when it comes to the dental diet – what foods are good for your teeth and what actually contributes to their ultimate demise. We hate to say that scary word but cavities have a lot to do with the food you put in your mouth. Don’t give in to the dental grim reaper. Let your San Francisco dentist help. Learn the story of the perfect dental diet while your teeth are still around to thank you. Did You Hear the One about the Sweet Tooth? It doesn’t have a happy ending. Sugars, or more specifically simple carbohydrates, start working on teeth the very second they go over the lips and through the gums. Bacteria in your mouth, we all have it, converts sugars into acid that eats away at tooth enamel. The next time the dentist points out a cavity, you know whom to blame. Sounds pretty good after all. These are all foods high in nutrients that help protect enamel. Eating them leads to something called remineralization – a natural process in which the body deposits key minerals in the enamel fortify it. Strong teeth stick around. Most people realize that the gunk the dentist removes during a cleaning is bad news. 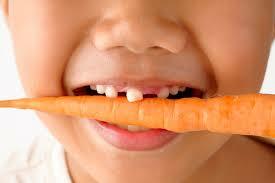 Eating crunchy foods like broccoli and apples scrapes away plaque – that actual name of that funky stuff. When you are having a craving for something sweet, reach out for a pear or apple instead of a candy bar to give your teeth a good cleaning too. Aren’t fruits just nature’s candy? It is true that fruits have sugar that converts to acid. The difference is fruits like apples and pears have high water content, as well as being crunchy. What this means is the sugar is naturally dilute and less destructive. This isn’t true for all fruits, of course. Bananas, for example, are healthy foods in moderation but not necessarily good for your teeth. They don’t have the same crunch or water content as other fruits. So, there you have it. The dental diet is a good news/bad news tale. You can still eat food that tastes good; you just have to smart about it to avoid a dental emergency. Stay out of the candy aisle and hit the produce department instead. Along with positive oral hygiene, the right dental diet will keep you smiling for years.